Get the most current catalog here! You may have received it in the mail, but if not click here to download in PDF format. We send newsletters approximately twice a month. 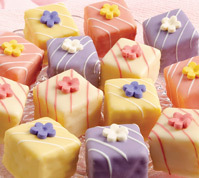 At Divine Delights, we combine pure, natural flavors with hand-made decorations to create unique petits fours and special occasion cakes that are as delicious as they are beautiful. Each season brings new delights and surprises. 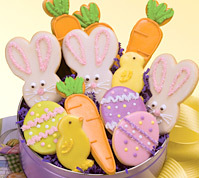 Divine Delights is family owned and operated by veteran bakers Bill and Angelique Fry, who enthusiastically develop and create artistic seasonal items, such as whimsical animals, charming tea hats, graduation caps, and birthday, wedding and holiday-themed petits fours. 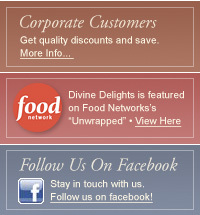 Divine Delights is the premium source for handmade petits fours, cakes, brownies, and shortbread cookies in the US. Delivery is available anywhere in the US, including Alaska and Hawaii. To read more, go to our About Us page.